A religious epic, The Ten Commandments is the story of Moses recounted on an impressively massive scale. In ancient Egypt, the Hebrews are enslaved people, used primarily for the arduous task of constructing massive monuments and new cities. The Pharaoh hears of prophecies that a newborn will grow up to lead the slaves to freedom, and orders the death of all male Hebrew babies. Slave Yochabel (Martha Scott) packs her infant son in a basket and sets him adrift on the Nile to spare him from death. 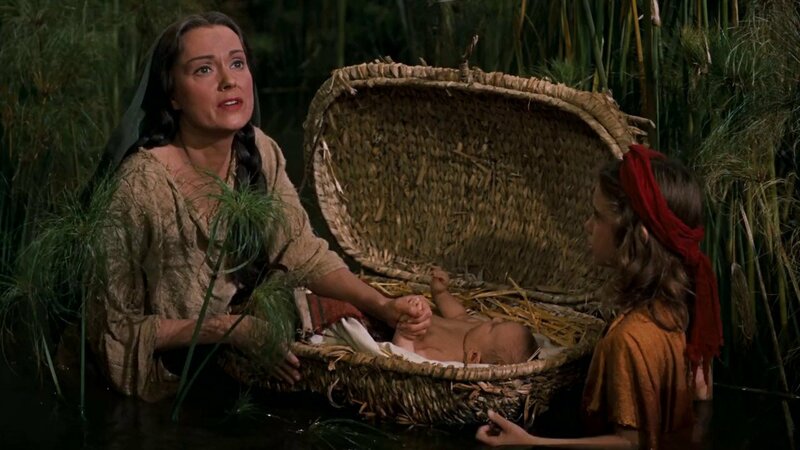 He is picked up and adopted by the Pharaoh's daughter Bithiah (Nina Foch), and she names the baby Moses. Only Bithiah's servant Memnet (Judith Anderson) knows that the baby is the son of Hebrew slaves. Moses (Charlton Heston) grows up vying with Rameses (Yul Brynner) for the right to succeed Pharoah Sethi (Cedric Hardwicke) to the throne, a prize that comes with marriage to the ambitious Nefretiri (Anne Baxter). Rameses recruits the services of Hebrew collaborator Dathan (Edward G. Robinson) to try and uncover the identity of the Deliverer who will free the slaves. Moses is more capable and more resourceful than Rameses, and also more empathetic to the plight of the Hebrews. He demonstrates mercy to stonecutter Joshua (John Derek) and Joshua's love interest and water carrier Lilia (Debra Paget). But before Moses ascends to the throne, Memnet intervenes, forcing Moses to face his true destiny. Spared from death, he marries Bedouin shepherd's daughter Sephora (Yvonne De Carlo) before embarking on a monumental battle of wills with Rameses. Producer and director Cecil B. DeMille's crowning achievement (and his second crack at the story after a 1923 silent version), The Ten Commandments is three hours and 40 minutes of grand storytelling, old-fashioned Hollywood at its extravagant best. The cast features a galaxy of stars, the extras in some scenes number in the thousands, the sets are numerous and impressively crafted, and the film bursts with the colours of abundant and imaginative costumes. The popular Moses and Exodus stories are probably amalgams of people and events composed from legends, fractured oral histories and religious texts. To his credit DeMille cites several books as sources for the film, and benefits by steering away from Bible-in-pictures territory. The long story unfolds in four manageable parts: Moses' rise to prominence as a military leader, city builder and potential future Pharoah; his awakening to his true origins and acceptance of his destiny; the struggle to free the Hebrews; and finally the arduous Exodus out of Egypt and towards the new challenges beyond. The narrative is punctuated by several memorable setpieces. The scenes of mass motion and human activity feature outstanding choreographed artistry, and DeMille always maintains a strong hold on what his cameras are capturing. The city-building, rock-making and Exodus sequences make use of extras in every corner of the VistaVision screen, conveying a profound sense of open space, ongoing industry and masses on the move. The latter parts of the film scale some unforgettable heights. Moses and his close allies sheltering during the haunting passover night is a quiet but immensely powerful moment in the shadow of creeping horror. The pillar of fire halting an army, the extraordinary parting of the Red Sea, and the Ten Commandments being carved in stone by mystical flames are innovative visual achievements representing the era's state of the art. And despite all the theatricality on display, The Ten Commandments generally avoids the pitfall of overstated reverence. This is a movie that tries hard to represent real people, and naked ambition, conspiracy, sensuality, doubt, and human emotions and fallibilities are on display. The script does not try to sound as if every spoken word needs to be enshrined on a hallowed wall. A story this big needs sturdy acting shoulders to stand on, and DeMille assembled an impressive cast, with the luxurious length affording substantive screen time for several performers. Charlton Heston rises to the challenge of portraying Moses with plenty of authoritative presence, whether as a strapping young man earning his way towards the Pharoah's chair or as the grizzled prophet leading his people to freedom with supernatural winds in his sails. 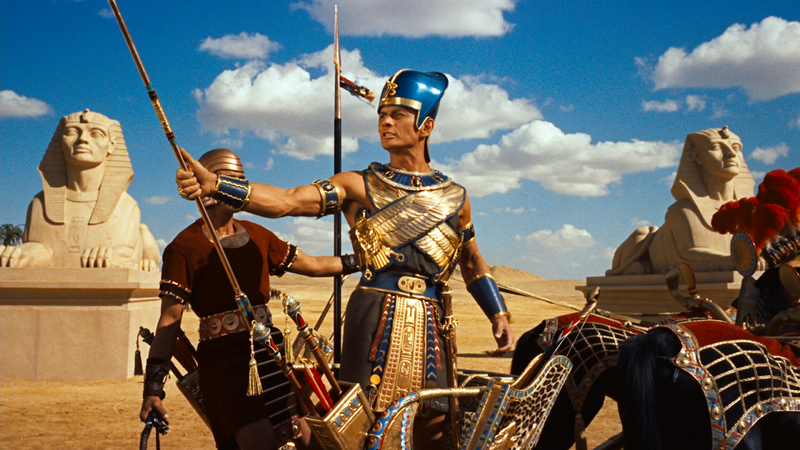 Heston needed a robust foil to shine, and Yul Brynner delivers as Rameses, Moses' rival for leadership and subsequently his existential foe in the struggle to free the Hebrows. Until late in the film Brynner remains a strong presence representing the Egyptian viewpoint. Edward G. Robinson, Anne Baxter, John Derek, Nina Foch, Martha Scott, Yvonne DeCarlo, Debra Paget and Cedric Hardwicke all provide sustained and animated support, DeMille wisely introducing most of the key characters early in the story and then coming back to them repeatedly in different contexts as Moses' life evolves. 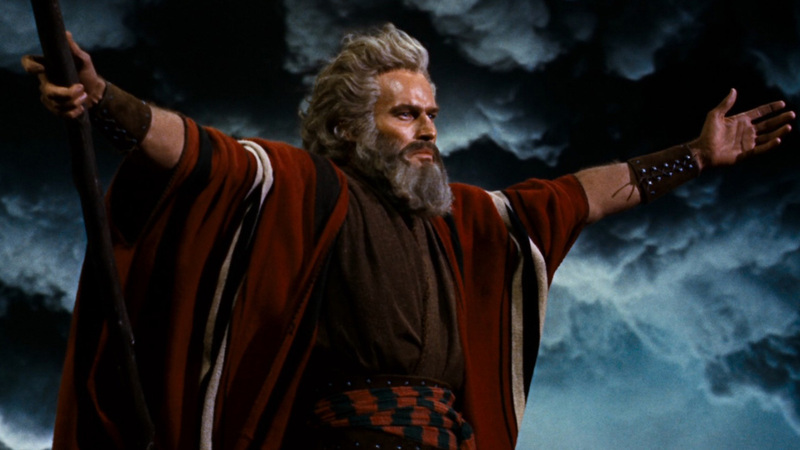 Bold and grandiose in breadth and scope, The Ten Commandments is a domineering and engrossing cinematic achievement.